Kicking Off the I'm Not This Girl Blog Tour for Nina-Marie Gardner! 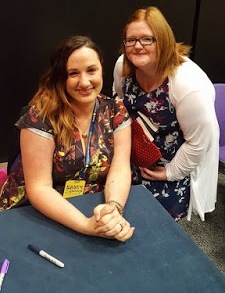 Nina-Marie Gardner is one of my favourite authors she is just amazing and her writing is carzily addictive so I was over joyed when she said I could organise her blog tour.... Literally screaming with happiness over joyed! The full blog tour will be available by the end of today so please look out for it! Nina-Marie Gardner was born in New York City. Her debut novel Sherry & Narcotics was published in May 2011 (Future Fiction London) and her second novel, I'm Not This Girl will be published March 2012. Her fiction has been published in 3AM Magazine and the anthologies Bedford Square and 3AM London, New York, Paris. A graduate of Yale University and the creative writing program at the University of London, Royal Holloway, she has lived and traveled extensively abroad. Currently she lives with her dog Lulu in Williamsburg, Brooklyn. "Gardner's writing is ridiculously addictive." A cautionary tale of love and loss—beautiful, raw and heart-wrenchingly honest. "I'm Not This Girl" chronicles the hair-raising journey of shy outsider Lulu, who with her faithful mutt Trouble seeks for meaning, identity and redemption in a world turned upside down by her own catastrophic personality. From the hipster enclave of Hollywood's Silver Lake Hills, to Manhattan at the peak of the dot com boom and bust; through the aftermath of 9/11, to a psychiatric hospital in the Arizona desert, only when Lulu finds her way back to London, the city where she was born, does she come to terms with the truth she's been running from. Look out for the awesome giveaway as well coming soon!